And what was this impact recognized by the Szent-Györgyi Prize’s selection committee? Croce’s research established the direct and causative association of chromosomal translocations with the molecular mechanisms of oncogene activation. These translocations are, in fact, genetic abnormalities caused by a rearrangement along chromosomes. He was among the first to identify such translocations as primary drivers of cancer formation—their occasioning being a genetic hallmark of the disease. Furthermore, Croce has been responsible for identifying and isolating several important oncogenes and tumor suppressor genes, such as BCL2, ALL1 and LZTS1. These various genetic science breakthroughs have paved the way for a number of new therapies targeting cancer. In 2019, it can seem astounding that the link between cancer and a patient’s genes was overlooked for so long. But it was not until 1953 that the structure of DNA itself was discovered; not until the 1970s that cancer “clusters” were identified in families; and not until 1993 that the first oncogene, a cancer-causing gene, was identified. 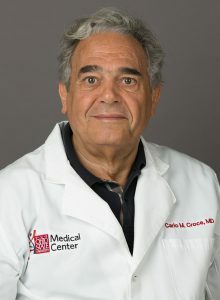 Over three-plus decades in the City of Brotherly Love, the increasingly renowned cancer genetics specialist held various laboratory, teaching and senior administrative positions at such institutions as the Wistar Institute, University of Pennsylvania, Children’s Hospital of Pennsylvania, Temple University and Sidney Kimmel Cancer Center at Thomas Jefferson University. In 2004 he transferred to Columbus, where for 14 years he served both as a professor and as department chair of cancer biology and genetics within the The Ohio State University’s medical school. Croce was also instrumental in the development of the AbbVie drug venetoclax (sold as Venclexta and Venclyxto), a medication used to treat chronic lymphocytic leukemia. An inhibitor of BCL2, it is extremely effective in killing cells affected by that gene. But, as Croce is quick to note, it took 32 years for the drug to in 2018 obtain regulatory approval in the U.S.—a long period even by the exhaustive standards of a typical novel drug’s lifespan. Now focusing his efforts as an OSU professor, the luminary hasn’t slowed down one bit. Croce continues his investigations into studies of the molecular changes in genes that lead to cancer. He is particularly interested in the early changes of malignancy and how they might serve as targets for new treatment and preventive agents. As someone who, even in his early days as a student in Italy, wanted to be part of the fight against cancer, Croce most recently made a breakthrough in microRNA research. His evidence that these small, non-protein-coding RNAs play a role in human cancer could also revolutionize medicine—and open the way for development of microRNA-based therapies. “In all my career, I did what I loved the most: Make discoveries,” says Croce. Cancer patients can reap the rewards of his work. And this is certainly prize-worthy.